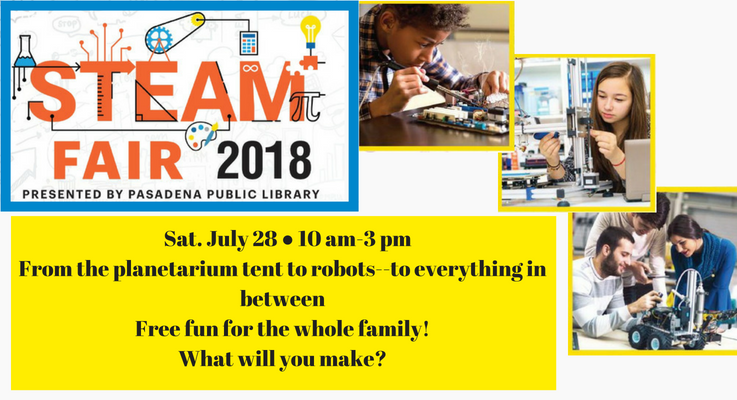 Come visit our STEAM Fair Saturday, July 28 at Central Library from 10 am to 3 pm! We’ll have a planetarium tent, open house for our new Innovation Lab, Virtual Reality Demos, robotics, and much more! There is free fun (in an air-conditioned building!) for all ages. If you like science, technology, engineering, arts or mathematics, we’ll have something to catch your fancy! To set the mood, here are a few STEAMy titles to check out. At the heart of Horn’s funny and compassionate novel is a 2,000-year-old Jewish mother seeking reasons for living, some way of dying, and help for her 56-year-old son who lives in her basement. Rachel’s story begins in Roman-occupied Jerusalem, where at 16 she marries her father’s apprentice although she loves the high priest’s son, Elazar, and is pregnant with Elazar’s baby. Two years later, when the child falls ill, Rachel makes a bargain with God: she must give up not her life but her death in exchange for the child’s survival. The child survives, and Rachel endures successive lifetimes over the next 20 centuries, each lifetime immediately following the previous. Elazar, having made a similar bargain, pursues Rachel through time, occasionally finding her, though never for long. Now in 21st-century New York, Rachel’s current form (or “version,” as she calls it) is an 84-year-old widow. She thinks she has found a way to finally die, but first she wants to see her current problem child, the one in the basement, get a life. She also wishes to protect her granddaughter, a medical researcher dangerously close to discovering the truth behind Rachel’s unusual DNA. Horn (A Guide for the Perplexed) weaves historical detail and down-to-earth humor into this charming Jewish Groundhog Day spanning two millennia. Theoretical physicist Kaku (The Future of the Mind) wonderfully illuminates possible ways the human race could survive on other planets. Kaku, certain that “either we must leave the Earth or we will perish,” begins with a brief history of humanity’s space-faring efforts before turning to current efforts to return to the Moon and reach Mars, led by billionaires such as Jeff Bezos, Richard Branson, and Elon Musk. After discussing how Mars might be rendered livable, Kaku describes the possibility of reaching bodies beyond our solar system. Following these theoretical milestones, Kaku plots increasingly speculative ways that humans might reach further solar systems and eventually escape the end of the universe itself. The lengthy journeys required to reach such destinations prompt discussions of robots and AI, ways in which humans might become immortal, and the characteristics of advanced alien civilizations. The apparent suicide of a legendary mathematician drives Jacobs’s intricate and moving first novel. Isaac Severy, renowned for having developed complex predictive equations for seemingly random events, such as “the erratic pattern of melting ice in the Arctic,” dies in the backyard hot tub at his L.A. home after being electrocuted by a string of Christmas lights. His granddaughter, Hazel Severy, the owner of a struggling Seattle bookstore, receives one last letter from him, postmortem. In the letter, Isaac states that he hopes not to evade the assassin who has been following him; asks Hazel to destroy his “work in Room 137,” except for one equation, which she must hand over to a man whose “favorite pattern is herringbone”; warns her not to stay in his house after October 31st; and tells her that he is but the first of three people who will die. Hazel attempts to honor her grandfather’s cryptic last requests and solve his murder. Plausible depictions of psychologically wounded characters enhance the surprising plot twists. High math, Eastern European history, and American culture converge in this hugely entertaining debut from geophysicist Rojstaczer. After Rachela Karnokovitch, a Polish émigré and University of Wisconsin professor regarded as her generation’s leading mathematician, dies from cancer in 2001, her middle-aged son, Alexander, a meteorologist also known as Sasha, is tasked with organizing the shiva for her. Though his family is challenging enough, Sasha’s real difficulties begin when dozens of his mother’s colleagues descend on Madison to pay their respects. Brilliant, awkward, lovable, and selfish, these superstar mathematicians prove to be less interested in mourning Rachela than in uncovering her secrets—particularly her rumored solution to one of math’s most famous enigmas, the Navier-Stokes problem. The ostensible mourners rip up floorboards, hold séances, and even read meaning into a 40-year-old parrot’s squawks, all the while discussing the charms and pitfalls of Eastern European identity and the perpetual shock of life in America. Counterbalancing their antics are flashbacks to Rachela’s childhood flight from Poland during WWII. These passages, presented as excerpts from her memoir, add depth to an already multilayered story of family, genius, and loss. Palmer’s lengthy, complex, highly challenging second novel is more brilliant than his debut, The Dream of Perpetual Motion. Philip Steiner is working to develop a causality-violation device—a machine that will make it possible to visit and interact with the past. Meanwhile, Philip’s wife, Rebecca Wright, an employee at an online dating company, must cope with past tragedy. Far more than a standard-model time travel saga, this science thriller deals with love, politics, history, loss, tragedy, bonding, craft beers, jogging, Internet dating, alcoholism, temptation, sin, redemption, rock ‘n’ roll, jazz, Rudolph Fisher, and gourmet cooking. It takes place in the very near future, or perhaps in a slightly variant universe where reality can vary from one moment to the next. Is that really Ronald Reagan’s face on a $20 bill, or the face of another president (definitely not Andrew Jackson)? Humorous set pieces include an utterly hilarious cocktail party set in a luxurious high-rise condo overlooking New York’s Central Park. Palmer earned his doctorate from Princeton with a thesis on the works of James Joyce, Thomas Pynchon, and William Gaddis. This book stands with the masterpieces of those authors. When you wish upon a star, do you ever consider that the bright one over there in the Hyades might be closer than the one in the Big Dipper that you usually wish on? Or that your wish might get there faster? Although even the closest star (Proxima Centauri) is so far away (25 1/4 trillion miles) that humanity will probably never travel to it, Ferguson (Prisons of Light: Black Holes) demonstrates why knowing its distance from us is important, and not just for reasons of wish fulfillment. For only by drawing an accurate scale map of the universe, she explains, can scientists estimate its age, one of the most hotly contested issues of our time. Ferguson begins with attempts in antiquity to establish the distance to the sun and the five planets seen by the naked eye. She discusses the findings of Copernicus, Kepler and Galileo, and how each drew on the others’ work. Her simple explanations of the discoveries of stellar parallax, the Doppler effect and redshift, and of absorption spectra make important scientific concepts clear for general readers. She goes on to elucidate how astronomers determine how far away other stars are by using a type of star called Cepheid, as well as the spectacular stellar self-destructions known as supernovae as “standard candles.” To conclude her engrossing survey, Ferguson covers some of the paradoxes that scientists confront, such as that some estimates of the age of the universe have determined that it is younger than some of its oldest stars, and that the amount of observable mass in the universe is only about 10% of what should be there. Albert Einstein may not have been the only mastermind behind his groundbreaking ideas about relativity; it turns out the renowned theoretical physicist collaborated a great deal with his first wife, Mileva Maric´—a Serbian woman of modest means who was one of the few women to study math and science at the Zurich Polytechnic School where the two meet. In her compelling novel, Benedict shows how Mileva transforms from a sheltered girl into a personally and professionally fulfilled young woman as she meets other educated women like her in the Swiss boarding house near her school and, through her new acquaintance Albert Einstein, engages in theoretical discussions with male colleagues during which her intelligence is both admired and supported. But Albert and Mileva are a product of their times; the turn of the century wasn’t exactly a liberating time for women, and the self-centered Albert has no compunctions about deleting her name from papers they assiduously work on together. Their tenuous personal life (including a child he ignores), his affairs, and his insistence that his wife be more possession than spouse causes the marriage to implode. Did giving Mileva his Nobel Prize earnings assuage his guilt for her unacknowledged assistance and confirm her contribution to his work? Benedict makes a strong case that the brilliant woman behind him was integral to his success, and creates a rich historical portrait in the process. A determined young woman, born into a Quaker community in 19th-century Nantucket, defies social norms on the path to becoming a “lady astronomer” in Brill’s charming debut novel. Very loosely based on historical “girl” astronomer Maria Mitchell, Hannah Price spends her days going to Quaker meetings and tending to books at her town’s library, but nights she spends with her eyes on celestial bodies or crouched over mathematical calculations, dreaming of discovering a comet all her own. A serious girl obsessed with the pursuit of knowledge, Hannah fears the passionate restlessness of her twin brother Edward, even as she rejects the strictures of marrying to attain stability. Hannah’s sober routine is interrupted when she takes on a new pupil, Isaac Martin, a sailor from the Azores, whose race shakes up Hannah’s standing in the town. Martin’s ideas and instinctive personal connection with his new teacher alter her attitude toward love and faith. From the main streets of Nantucket to its dunes and shores, from a Harvard observatory to the cities of Europe, Hannah’s emotional and professional journey will please fans of feminist-minded and romantic historical fiction. The world of the woman immortalized in Andrew Wyeth’s haunting painting Christina’s World is imagined in Kline’s (Orphan Train) intriguing novel. The artist meets Christina Olson in 1939 when he summers near her home in Cushing, Maine, introduced by Betsy James, the young woman who knew the Olsons and would become Wyeth’s wife. The story is told from Christina’s point of view, from the moment she reflects on the painting; it then goes back and forth through her history, from her childhood through the time that Wyeth painted at her family farm, using its environs and Christina and her brother as subjects. First encountering Christina as a middle-aged woman, Wyeth saw something in her that others did not. Their shared bond of physical infirmity (she had undiagnosed polio; he had a damaged right foot and bad hip) enables her to open up about her family and her difficult life, primarily as a shut-in, caring for her family, cooking, cleaning, sewing, and doing laundry—all without electricity and despite her debilitating disease. Hope of escape, when her teacher offers her the chance to take her place, was summarily quashed by her father. Her first and only romance with a summer visitor from Boston has an ignoble end when he marries someone in his social class. Through it all, the author’s insightful, evocative prose brings Christina’s singular perspective and indomitable spirit to life. Ferguson replaces the iconic but static image of cosmologist Hawking with flesh and blood in this vivid portrait. This is familiar terrain for Ferguson, who built such good rapport with Hawking while researching her book Stephen Hawking: A Quest for a Theory of Everything some 20 years ago, that he asked her to consult on his own book, The Universe in a Nutshell. Hawking grew from a “rather lazy” student to a pioneering cosmologist in an era when the field was regarded as little more than a pseudoscience. Diagnosed with amyotrophic lateral sclerosis (Lou Gehrig’s disease) early in graduate school, he defeated the odds and will soon celebrate his 70th birthday. Through interviews with Hawking and his colleagues, friends, and family, Ferguson builds a complete picture of Hawking’s life, from his tireless work to explain our universe to his notorious driving, playful appearances on Star Trek, The Simpsons, and other shows, campaigning to improve the lives of the disabled, and his family life, with special attention to his relationship with his first wife, Jane, whose sacrifices allowed him to focus on his work. In the end, Ferguson captures the very full life and work of one of the most vibrant minds of our time.